It is not even July and we have already experienced our second heat wave of the season here in NYC. From here on out it's shorts, tees, and messy up-dos. A cold soda pop in hand is most likely how you will find me. As miserable as the heat is, there is something inevitably great about the summer. cute outfit! i love your sunnies! Beautiful! I'm a great fan of your photos and your style! I love your outfit! there is a heat wave were i live too. it's not fun. I agree with that last statement! I am not one for the heat, but I look forward to what summer has in store for me! Love your outfit! Such a fabulous outfit!! Your sunnies and necklace are gorgeous! Look this heat is unbearable! I can't fade wearing anything more than a mini or shorts and tee! So simple and so cute. love the top! your hairstyle is so cute! 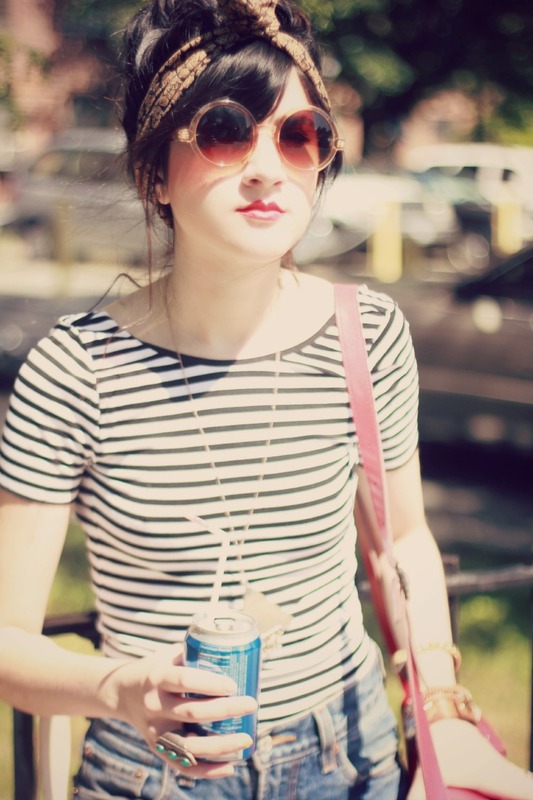 Love your lipstick and the retro look rose-tinted glasses! Love the shades and the outfit is what seems to be my summer uniform. Love that you always wear a bright lipstick! Pretty! way to take in the heat stylishly! Love this outfit. You look perfect. what a fun casual outfit! Love the outfit, soo perfect for summer heat! I love your hair with that scarf! Your sunnies are to die for! Love this look! Woow, I love this outfit! The heat waves have been insane! I mean what else you can stay cool in besides easy tees and cutoffs? I love stripes! You look great! Love the hair wrap! I love your style! The heat waves this summer were crazy. My air conditioner broke during a heat wave and not having air conditioning in Fort Myers is unheard of. It was shorts and messy up dos for me too!